I am married to Jeremy and we have 2 boys, Jacob (10) and Jaxon (7). Jeremy and I met at Troy University when I was working as a graduate assistant for the Development Department in athletics. He was the Defensive backs coach at the time. I am currently a 3rd grade teacher after being a stay at home mom for 6 years. We have been married since April 2006, so going on 13 years! We have been on staff at Troy University (Troy, AL), Colquitt County High School (Moultrie, GA), and currently Georgia Southern University (Statesboro, GA). One of the most important things about being a coach’s wife, especially when children come into our world, is to have a good support system! Since we move around, we are not always close to family. Those of you who are…consider yourself blessed! 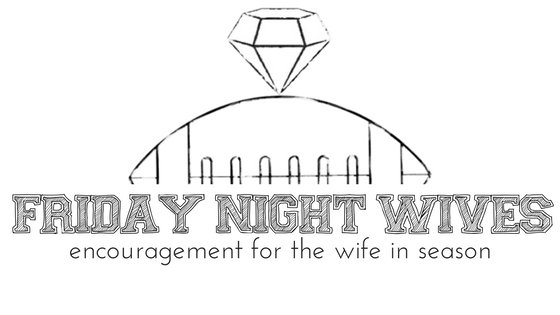 Other wives on staff are amazing at jumping in to help because they know what you are going through. Don’t be afraid to ask for help!! I am a very independent person, but I have learned to let go and let others help me and it has made all the difference in the world. Another piece of advice is to make any place you go, HOME! When you move, find a good church, a good school or preschool, a bible study group, a group of friends (outside of the coaching world) to workout with and hang out with, and get involved in your community! Even if you are only in the area for one season, making it home makes things so much better for you and your family. As in all relationships, communication is important when it comes to balance. I have learned that even when he is away from home, things work better if we stop and make a quick phone call or send a text about anything and everything. Life for us works best when we communicate. He shares his weekly schedule with me and I share mine and the kids with him. That way we are all on the same page. If there is some school function, doctor’s appointment or kids’ sporting event that I really want him to attend, I let him know and he always does what he can to be there. 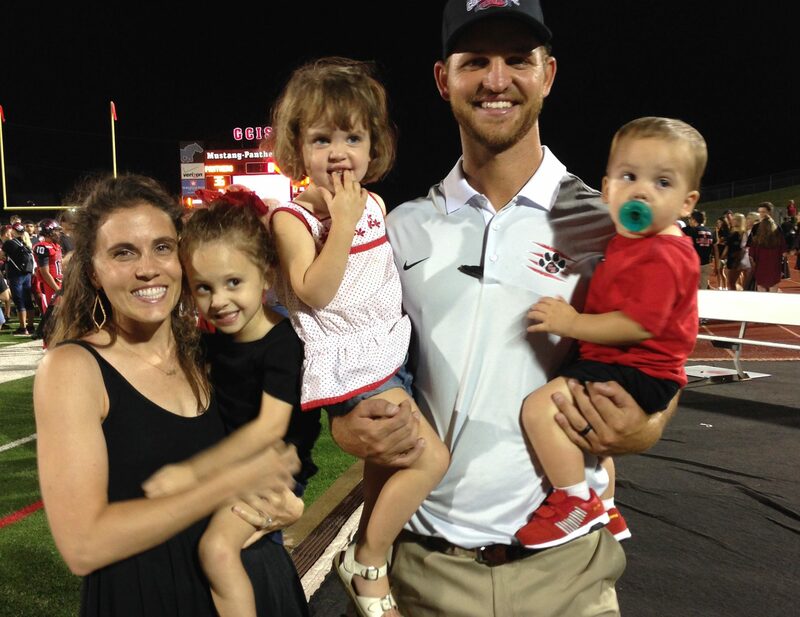 Football is a busy life, but family is always top priority. I know he can’t be at everything, but he makes arrangements to be at the events that mean the most to us. Another way to help not lose my mind is to take time for myself. Even if it means hanging out with other moms at play dates, I am still getting a little bit of me time while the kids are busy running around. Finding a good babysitter is an absolute must too!! I have always loved football and grew up with a daddy who coached so being “all in” is easy for me. I have always loved going to practice and making it to as many games as possible. It hasn’t always been easy having little ones but as they have gotten older, all those road trips and long nights have been worth it! I remember how special it felt hugging my daddy after games on the field and now I get to see how special it is for our boys and their daddy. It truly makes it all worth it! “This too shall pass.” Like many who are reading this, I have been on the “high” and “low” side of coaching. Being on the “high” is amazing, your whole world is happy! However, you can help make your world happy even in the “low” times. The biggest thing to remember is to keep going and keep encouraging. Your husband (and I am sure you do, too) hear enough negative so it is your job to be the positive. Not only will it lift him up, it will do the same for you. It is so easy to ride on what I call the “struggle bus”, but that is a terrible place to be. Go to practice, show up at the office with lunch or dinner, take kids too, so you can get a happy moment with him. If you happen to get lucky and have a weekend off, get away for the night and enjoy yourselves. You will also want to find another wife or two to lean on and talk to during this time. They have all been there and know how you feel. Listen to them and take their advice. It is so much easier to vent to ones that know exactly how you feel so they can help! The most important thing is to PRAY!! Pray for your husband, your children, yourself and the situation. God has a plan for us all! You may be in a valley right now, but you are there for a reason. If you lean on HIS guidance you will come out better than when you went in.